Progenitors of the new wave of British heavy metal, Saxon have reached a milestone in their career. The group can now say they have 40 years of album releases. That’s an impressive feat in itself, but that fact that they’ve remained relevant and busy makes it even more impressive. One could say they’re the most consistent of all NWOBHM bands. The band released Thunderbolt, their 22nd album, last year. Then they went on tour in the States to support the record with Judas Priest. The Priest tour was known as the Thunderbolt Tour. Now they’ve changed the name to the 40th Anniversary Tour and are hitting cities across North and South America. 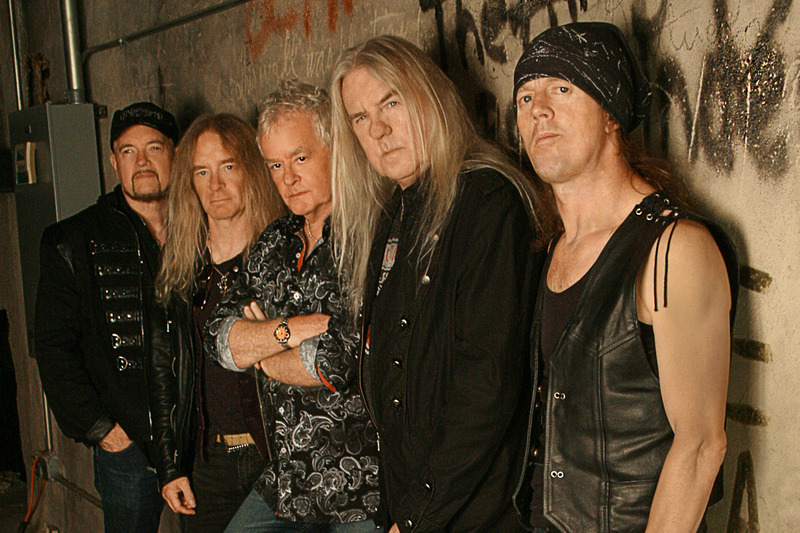 Saxon frontman Biff Byford spoke with Heavy Music Headquarters about this tour, and commented retrospectively on the band’s legendary career. Darren Cowan: How is this leg of the Thunderbolt Tour going? Biff Byford: Pretty good. We’ve turned it into the 40th Anniversary Tour now. We do a couple songs off Thunderbolt but we turned it into the 40th Anniversary Tour, which started in America. These are the first shows of the tour, so we’ll probably stretch it and later in the year come back to do some bigger shows. We put these in around the Monsters of Rock Cruise. The shows are a bit low key, but it’s done pretty well. Last year you toured with Judas Priest. How was that tour? Have you shared the stage with them in the past? The first time we toured was in 1980. That was our first ever European tour with Judas Priest. We’ve known them for years. We’ve played with them in various points in our career. We did a lot of TV shows together back in the day. We’ve known them pretty well. We did top 40 shows in 1980/81. All of those bands like Priest, Maiden, Saxon, Motörhead, Whitesnake were on the TV chart shows, particularly, top of the pops before MTV. You could go there and play live. It was pretty cool. How do you condense 40 years and 22 albums into a set list? Sometimes the title tracks are the most popular songs for some people. They might want to hear “Crusader” or “Lionheart.” You can get deeper into those albums, but I think the majority of people’s favorite song is the title track, if you’ve got a title track. We pretty much keep it to what people want, the more popular songs people ask for. There are a few curveballs in the set that people haven’t heard before. You mentioned this being the 40th Anniversary Tour and no longer the Thunderbolt Tour. Are you still playing much material from Thunderbolt? We do two or three songs. People have already seen songs off that album on the Judas Priest tour, so we’re changing it up a bit more. It’s pretty cool. People like it. How do you feel about the Thunderbolt album? I think it was a fantastic album that came out last year. We used the same producer as the last album Battering Ram (Andy Sneap). The album did well. Mythology, whether it’s the classic, Greek and Norse sort, or modern mythology of vampires (“Nosferatu, The Vampire’s Waltz”) is the centerpiece of the album’s lyrics. Was mythology a central theme of the album? The way I write albums songs are rarely connected. I don’t write concept albums. I’ll have a great concept and a good title and I’ll work around it. I came up with “Thunderbolt” first and then worked backwards more towards the Greek gods because Zeus’ symbol is a thunderbolt. That’s pretty cool instead of just singing about lightning. It was a bit deeper, lyrically. I messed around with “The Secret of Flight” and “Nosferatu.” I was asked to do some lyrics for a vampire film, so that’s where “Nosferatu” came from. Nibbs [Carter, bass] came up with a really dark riff, which I liked and fit the lyric. That’s really how it works for me. The lyric and the music have to connect some how. A dark lyric must have dark vocals and a dark sound. If it’s more upbeat, it can be a much brighter song. Speaking of lyrics, the one album that really makes me think Saxon is Crusader. In the beginning, you have that name Saxon and then you made that album later. Was that something you intended to do? Not really. Again, it came from me writing in the third person a young boy watching knights go off to war, and he wants to go with them:“Crusader, crusader, please take me with you.” That’s where that comes from. It’s based on that European history of knights going off to the crusades. The crusades were secondary to it, really, but they were called crusaders, which is a great name. So I just put the names together and wrote a song about a guy who wants to go off to war. Looking at the band’s history, you’ve been around 40 years. In that time, a lot of styles have come and gone. The NWOBHM ound was huge in the late ‘70s and early ‘80s, but then it began to fade with oncoming hard rock trends such as glam in the ‘80s and grunge and nu metal in the ‘90s. However, traditional heavy metal made a comeback in the last decade or so. How do you feel about the new crop of bands coming out, especially with the advent of The Internet, that cite British heavy metal bands such as Iron Maiden, Judas Priest, Diamondhead and you guys? How do you feel about being an influence 40 years since your inception? I think it’s good. Guitarists, bassists, drummers, keyboard players, vocalists have to find somebody they can look up to like a Lemmy to emulate yourself to greater things. When we started, we had bands like Sabbath, Purple and Zeppelin. We were emulating those guys. We wanted to travel the world, meet girls, have fun and write songs. Our style was different than them. It was a bit more modern at the time. It was a bit more focused on the energy. We weren’t so blues oriented. It was a great time. When you started in the mid-seventies, it wasn’t out of question for a rock band to release more than one album in a year. Led Zeppelin is famous for doing that. Saxon released two albums in 1980: Wheels of Steel and Strong Arm of the Law. Why did you release two albums in one year? Why do bands no longer do this? I think it was we were prolific. We had a lot of ideas bouncing around. We were really into song writing, so when we finished the Wheels of Steel tour, we started writing the Strong Arm of the Law album. We wrote it very quick and recorded it in three weeks. The band banged it out. That’s how it went. I don’t think we thought much about it at the time, but looking back I think we could have slowed down a bit. We were moving faster than the audience. The audience had just gotten Wheels of Steel. They bought it and were processing it, picking their songs and we were touring a little bit on it. We came out and said “You got that one, now get the new one!” We probably toured more on Wheels of Steel, especially in America. It did really, really well in America. I think we cut the head of the monster a little bit, but it came together. I think we were moving faster than the industry. The industry wasn’t ready for two albums a year. So what you and Zeppelin did was an anomaly? I think it was a bit of a one-off. People don’t usually do it. It’s a bit of a special thing. It’s good to have something in common with Zeppelin, isn’t it? There is no rock band on the planet that is not influenced by Led Zeppelin. Rock the Nations had no bassist, so you recorded the bass. What do you recall about these recording sessions? I was a bass player before I was a singer. I sometimes play bass while recording and writing. It’s easy. I wrote the songs on the bass, so we just did the bass. It sounds great. We had a bass player live. I just did the bass for the album. Elton John appeared on “Party til You Puke” and “Northern Lady.” How did this happen? Are you friends with Elton? He was in the same studio, so we got to know him. He checked in with the band. We had a song “Party til You Puke.” It’s a bit irrelevant. We thought, “Let’s get Elton John to play on that song. People will be surprised by it.” So that’s what we did. Looking back on this long career, did you ever expect to be where you are now? I don’t think you expect anything. I think you hope you’re going to be somewhere, but I don’t think you expect it, especially being English. We are pretty much underdogs, so what we get, we have to work for. It’s been great, though. We have some highs, some lows, some highs, some lows. That’s how it is in the rock business. We’re very happy with the albums we’ve done; especially the albums in the last ten-twelve years have all been great. We’ve found a seam, a rich seam of creativity. We’re still writing in it. We’re still digging in that seam.